Fire crews have been despatched to put out a blaze 60m (200ft) from their own station. Two engines came out of their Royston base with blue lights flashing at about 18:00 BST. Firefighters then turned left and drove about 65 yards down Baldock Road before stopping to tackle the flames. 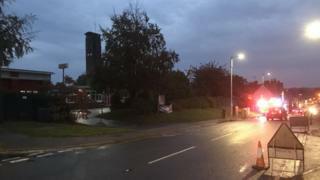 A spokesman for Hertfordshire Fire and Rescue Service said the "small fire" had taken hold in the joist of a building. Asked whether it was the shortest distance a fire engine had ever been despatched to, he added: "Apart from any incident at a fire station then, potentially, yes it could be."